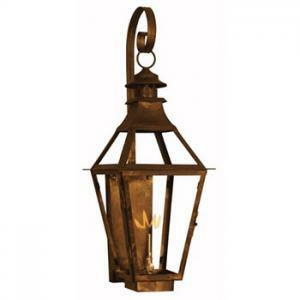 The Chesapeake Gas Lantern handcrafted by St. James Lighting is the perfect addition to any home or commercial building. In tradition with Colonial style the Chesapeake comes standard with a top curl on all wall mounted versions. Available brackets include Copper Wall Mount, Steel Wall Mount, Copper Post Mount, Steel Post Mount, Ceiling Yoke Mount, Ceiling 1/2 Yoke Mount Other Brackets available upon request. Pending on the features you select, the price of this product can range from $329.00-$549.00.